The pool at the Queen Mother Sports Centre has a special place in my heart - it’s the place I properly learnt how to swim. While it’s not the most visually exciting of pools, at 25m long and pretty shallow most of the way, this is a reassuring place for the beginner swimmer to do a few lengths. It has a separate diving pit where the synchronised swim team meet - so if swimming in straight lines is too boring for you, check them out. You also get your 20p back from the locker – something that can’t be overstated as a big plus. St George's Pool is a bit of a hidden gem. It’s 33m long and the deep end drops away to make it deep enough for the pool to have diving boards. Both its length and depth scared me when I first visited as a rubbish swimmer, but over time they’ve become plus points. There’s usually a maximum of three lanes open which leaves half the pool open for kids to splash about in. The big windows on either side and the pool’s elevated position on the first floor mean that there’s lots of light shining through and if you’re here at the right time you can watch the sun go down as you swim. 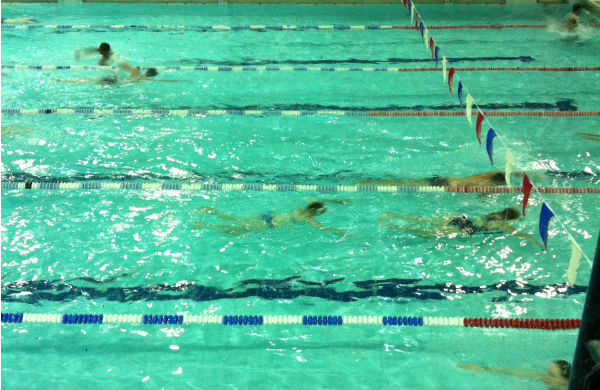 As I’ve gotten better at swimming, I’ve learnt to appreciate Clissold Leisure Centre. This place has three pools – the main pool, a training pool and a toddlers’ pool. The main pool is just 25m long, BUT it’s 2m deep the whole way. So there’s no shallow end for kids or for those who think that going swimming with their partner is a romantic activity and that their fellow swimmers want to witness their public displays of affection. It’s not and we don’t. You might think Holborn would be the last place to head for a relaxing outdoor swim. But you’d be wrong. In the Oasis Sports Centre there are two pools - one indoor and one outdoor. Both are heated and they’re next to each other so you can warm up indoors before making a quick dash through the cold air and plunging into the comparative warmth of the outdoor pool. Staring up at the sky and hearing the faint buzz of traffic is an unusually relaxing experience. It also has the most spacious changing rooms of any of public pools I’ve visited. London has some fantastic lidos that are great for swimming in during the summer. But London Fields is heated and open all year round. At 50 meters long and with huge wide lanes, it’s big enough to never feel too crowded. As the name suggests, the Lido is in the middle of London Fields and having trees around it gives it an open-water feel at least while you’re doing backstroke.